“Allan has outdone himself with his latest accomplishment. This remarkable book is a must read and unlike any other personal account of a journey through life. It is not just about a journey - it is about a life filled with adventure and discovery. As Allan shares his adventures with his readers, we feel we are travelling with him. He takes us from playing and coaching sports to mixing up different soup recipes for Del Monte. He brings us along on a North Atlantic crossing on a merchant ship; he seeks his fortune in Europe and eventually finds his professional passion…horticulture. When I picked the book up I couldn’t put it down. It is skillfully written with a rare mix of loving attention, humor, practical wisdom and is chock full of life’s experiences. Allan intermingles stories about his childhood, family and professional accomplishments. 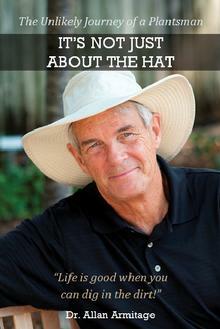 His heartfelt stories are funny, insightful and inspiring. Allan’s adventure takes us from his humble beginnings in Mt Royal Canada to Lansing Michigan and then on to Athens Georgia where he gained great notoriety as the foremost horticulturist and lecturer of his time. Oftentimes, we wonder not what our gardens grow, but who our gardens grow. 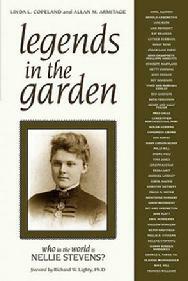 Legends in the Garden is a collection of the history, places, people, and stories behind the names of some of America’s most well known plants. These anecdotes, researched and written by authors Linda L. Copeland and Allan M. Armitage, are a compilation of forty-six of these little known origins of plant names. A compiled encyclopedia of Herbaceous Perennial Plants based on Dr. Allan Armitage’s horticultural trial gardens at University of Georgia. The Gardens of UGA are recognized as a premier trial site for breeders across the world. The data provided from Armitage’s studies help determine new plants suitability for American gardens. This publication has crossover appeal to gardeners, landscapers, and industry personnel. One of the world’s foremost horticulturists, Dr. Allan Armitage brings you an A-Z detailed guide of more than 630 species and cultivars of native perennials, biennials and annuals. In this concise volume, Armitage elaborates on garden worthy choices for every region, along with listings for nurseries, native plant societies, Internet sites and other helpful resources. Written in Dr. Allan Armitage’s trademark dry wit, this entertaining compilation of over 115 vertical plants delves into classics like Clematis and exotic newcomers, alike. In this publication, Armitage gives basic descriptions of size, habit, and hardiness but also discusses attractiveness and aggression of plants in certain regions. Gardening Expert Ruth Rogers Clausen details many versatile options for deer resistant plants, including full-color photographs, in this comprehensive guide. Clausen’s design tips and deer-resistant companions featured inside, offer insight into planting to avoid ravenous deer.